The AV-6413 is a high performance mini-OTDR, which is small in size, light in weight and rugged in configuration. It has a large color LCD and a USB interface. It also features a long battery operation life. 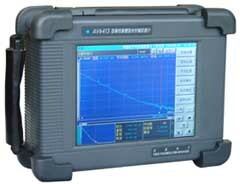 With the AV-6413, you can measure unit/connection/transmission loss and locate faults or breaks on optical fibers. It is widely applied in the manufacture, construction and maintenance of optical fibers.